If you care about Torrey Pines, trees in general, our environment, the natural beauty of OB – please attend tonight’s (Wednesday, Jan. 5th) Ocean Beach Planning Board meeting. 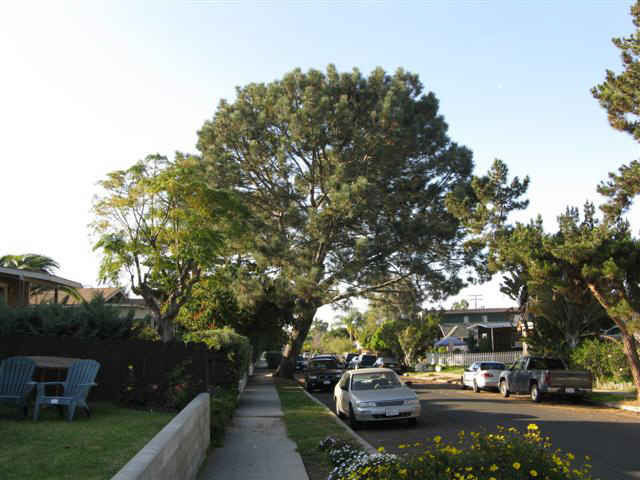 A solitary Torrey Pine – located at 4633 Long Branch Avenue – is on the agenda. It’s healthy – yet it grows at a slant. It’s majestic – yet its roots have grown and expanded enough to crack the sidewalk and a nearby retaining wall. The City of San Diego Street Division wants to chop it down. Local activists and the OB Rag have led the fight to save the 80 year old tree. We now have a certified arborist’s report that the tree is healthy and stable. This report will be presented at tonight’s meeting, which begins at 6pm at the OB Rec Center, 4726 Santa Monica Avenue. A month ago, the City gave its presentation to the Board – declaring the tree is a hazard and needs to be cut down. The Board decided it needed more information and gave the parties 30 days to come forward with additional evaluations of the tree and alternatives to its removal. The sidewalk repair needs to occur, but it can be done without harming the tree or its roots. The City has done this over on Saratoga Avenue – 3 blocks away – with other Torrey Pines on that block. The Torrey Pine is healthy and stable. It simply grows at a slant. It did not move or change during the recent highly windy storms. Torrey Pines are known to grow at a slant. Torrey Pines are a protected species here in San Diego – it is illegal to harm or kill them. In the wild, Torrey Pines can live to be 200 years old. What time is this meeting? 6pm, but the first 15 to 20 minutes or so are taken up by reports. The tree lives. Woot, woot. What a great start to a new year! The tree stays. Great work to all involved!!!!!! is there any irony in the fact that the same day that the treehugging OB Rag announced that the Torry Pine was saved they picked up a car dealership as a sponsor? Does this mean that the will be an OB Rag Priusmobile cruising the streets soon? Is this part of the GOP takeover of the House? no, freshie, it’s not a coincidence. enjoy your conspiracy theories. and welcome to Toyota of El Cajon. thanks for supporting community based journalism. On Monday night, Dream Street talent-buyer Drew McDaniel posted on the bar’s website that the venue was finished. Neither McDaniel nor bar owner Billy Savino was available for comment. Shelby Wickersheim, who owns and operates a Pacific Beach hair salon, has taken over the business and the liquor license and will rename the Bacon Street bar Mothers Ocean Beach. She did not return a request for comment. I saw nothing about it being closed/sold, but I heard that rumor as well. I have to say it’s funny to see OB referred to as, “…Trend setting and artsy…”. Newer Article: The Long Branch Torrey Pine Lives!